By Irfan in Toolkit. Updated on November 20, 2017 . For some of us who are constantly busy, notifications keep us on top of every important event, newsbit and information. It diminishes the waiting time while managing to update us with the latest happenings, and it’s no wonder we get notifications on desktops and mobiles alike. PNotify, formerly known as Pines Notify carries three main notification types: info, notice and error. It has a bunch of features, effects, themes and also styles. 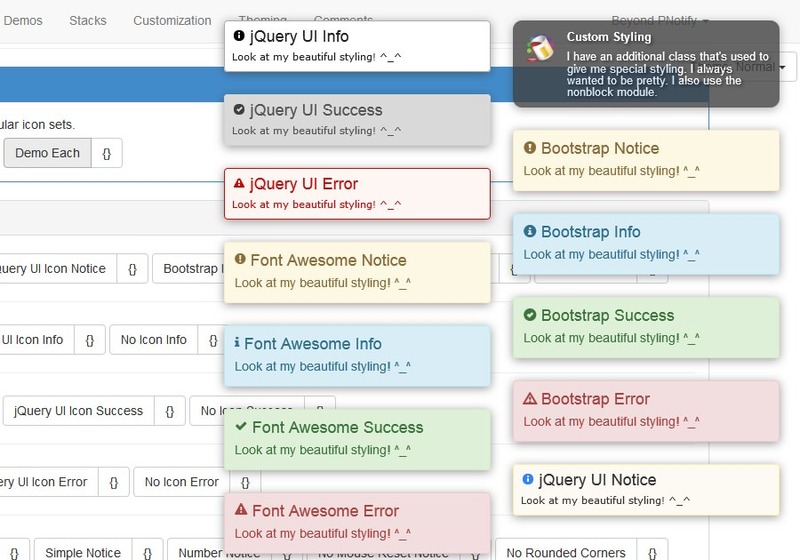 You can choose different styles from Bootstrap, jQuery UI, Font Awesome or go with your own style. There are also about 18 ready-made themes (made with Bootswatch) you can choose from and there are even transition effects. The great thing about PNotify is it does not just have awesome graphical features but it is also enriched with powerful and rich APIs (or modules). These APIs include desktop notifications (based on the Web Notifications Draft standard), dynamic update support, callbacks for various events, history viewer to see previous notifications and HTML support in the title and body. PNotify provides an unobtrusive notification which means you can click through any element behind the notice without dismissing it. You can also determine where the notification shows up with the Stacks features, which allows you to position the notice everywhere: as top/bottom bar style or even as a tooltip. PNotify’s sources come in customizable bundle modules and are available here. Basically, to create a notification you initiate a new PNotify function. The title, text, style and other options can then be passed inside the function. If you don’t specify the notification type, it will use the default type which is a notice. There are about 20+ configurable options you can pass. To see the list with its default value, click here. To change the style, you can pass the styling option in the notification and define your desired style. Available styles are bootstrap2, bootstrap3, jqueryui and fontawesome. Don’t forget to include related style sources within your project. text: "Hey, I\'m styled with jQuery UI theme." Modules are rich APIs that enable advanced notification features. There are 7 modules in PNotify: Desktop, Buttons, NonBlock, Confirm, History, Callbacks and Reference Module. Modules can be used by passing its appropriate options into the notification. PNotify.desktop.permission(); is used to make sure users have given permission for the site to show notification. If users disallow the site, the notification will be shown as a regular notice instead. As you can see, there is the additional option of adding desktop to the code. The desktop: true will enable the notification for desktop; if you set it to false, the notification will become a regular notice. You also may use a custom icon via the icon option. Fill it with your icon url; you can set it false to disable the icon. If you set it with null, the default icon will be used. To see other module implementations with their options, go to this link. You can further the implementation by going to its official site. There you can see some advanced usage along with the demos. Alternatively, you can visit its GitHub page for additional info.